About | Oh, for the Love of Vintage! Your guide to all things vintage,‘Oh, for the Love of Vintage!’ covers clothing & accessories, cosmetics & beauty products, a wide array of collectibles, vintage hairstyling and much, much more! Particularly focusing on the 1940s, 1950s and early 1960s. About Black Dahlia: Vintage doll. Jewellery maker. Lover of pearls. Kitschy. Serious coffee addict. Into Sherlock Holmes, Jack the Ripper, ghosts, horror, true crime, Tiki, mysteries, knitting & sewing, pinup art & photography. 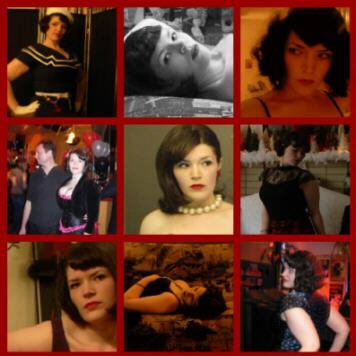 Canadian lover of vintage clothing and accessories, primarily the 1940s, 1950s and early 60s. Collecting vintage since I was a child including dolls, books, accessories, etc. Went full-fledged into wearing vintage clothing about nine years ago. Want to know more about me? Join me on Twitter and give me a shout! About Danny Ocean: Keen on all things vintage & retro, in particular the 40s, 50s & 60s. Likes include: classic cars and historic motorsport, The Rat Pack, Frank Sinatra, big band & swing music, cocktails & bars, musicals, live music, the list goes on……oh, and I play the drums, also! If you have any feedback, or would like to ask a question, leave a comment or send an email to ohfortheloveofvintage@yahoo.com. Thank you so much vintagestylequeen! Your posts are terrific! Thank you. AND just so you know, nothing and I mean NOTHING can be very unique or more unique or anything remorely used as a qualifier for the word “unique” as unique means “One -of-a-kind”. Not unusual or reare but one of a kind. I am willing to bet that some of your fabulous finds are so rare as nowadays to be unique! Keep up the blog! Yay! I also love these things you mention….the simpler things in life…sigh. 60s and 70s horror….retro recipes….retro hair salons….retro kitchen gadgets…extinct disney attractions….meh. I hate how things have changed. Ann, I do know as I have a couple of my own. This image will help you http://bit.ly/RmeHtS then fasten the clasp to an area inside your purse. That way you won’t lose your precious vintage gloves! I’ve just had the fortune of being awarded the Liebster Award for beauty blogs and as part of the protocol I’m nominated/awarded 10 other blogs as well.